JAMES KASS of San Francisco is Co-Executive Producer of the BRAVE NEW VOICES national youth poetry slam and founder of Youth Speaks! This will be an exciting and dynamic session open to all youth ages 13-21 interested in poetry, spoken word, hip-hop or performance! FREE! The workshop will be co-facilitated by LOGAN PHILLIPS, coordinator of the Tucson Youth Poetry Slam. 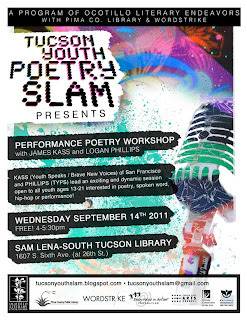 The Tucson Youth Poetry Slam is a program of Ocotillo Literary Endeavors, this workshop is presented in collaboration with Culturestrike and the Pima County Public Library.